I value the opportunity to meet and care for so many wonderful people from our community. As a dentist, I see people from all walks of life, each with their own dental needs and desires, and each with their own stories to share. It is my responsibility to learn a patient’s dental goals and concerns. Since each has a unique manner of communicating, and learns differently, I constantly have to adjust and adapt in order to establish clear understanding. I enjoy this challenge and appreciate the diverse patients I serve. During the treatment planning process, I am constantly thinking of the patient: what will work best for their situation; what will be the most efficient and comfortable approach that satisfies all of their needs? I only recommend treatment that I’d suggest to a family member and am always happy to explain my recommendation and answer patient questions. I believe the best dental care is a result of open communication between my patient, my team, and me. Together, we achieve beautifully healthy and natural-looking smiles, and keep those smiles in great shape! It is an honor to work alongside the staff at Alta Vista Dental. Many have been with the practice since it opened and have established wonderful relationships with our patient family. The team members strive to make sure our patients feel comfortable and welcome at the office. They are responsive, thoughtful, and caring, and they share my vision of delivering quality dentistry with a soft touch in a tranquil and supportive environment. 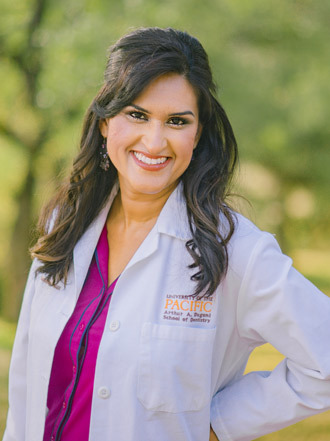 I completed my Doctorate of Dental Surgery at the University of the Pacific in San Francisco and have been practicing since 2012. The UOP dental program is rigorous and provided an exceptional foundational knowledge of modern dentistry. However, this is an ever-evolving field and it is my responsibility to stay current on emerging dental techniques and products, as well as new technologies. I complete more than 100 hours of continuing education each year, studying new options and expanding and strengthening my skills. As an active member of the Placer Academy Study Club and the Spear Study Club, I learn from and with my peers, as well as oral healthcare specialists. I also take a range of courses through the American Dental Association and California Dental Association. Originally from Los Angeles, I now live in Rocklin with my supportive husband and our two boys. Outside of work, the boys keep me busy with their many activities and interests. I try to make time to exercise and stay fit, but taking care of my family is my top priority.